Grandpa Makes: Little B’s Busy Board | Keeps Me Out Of Mischief! ‘Grandpa Makes’ will be an occasional series provided by my Dad! He retired about 15 months ago and has begun to fill his days with making things for his grandchildren as well as providing all kinds of home DIY services for his daughters – for which we are eternally grateful! I showed him this idea that I had pinned on my ‘Kids’ Pinterest board. 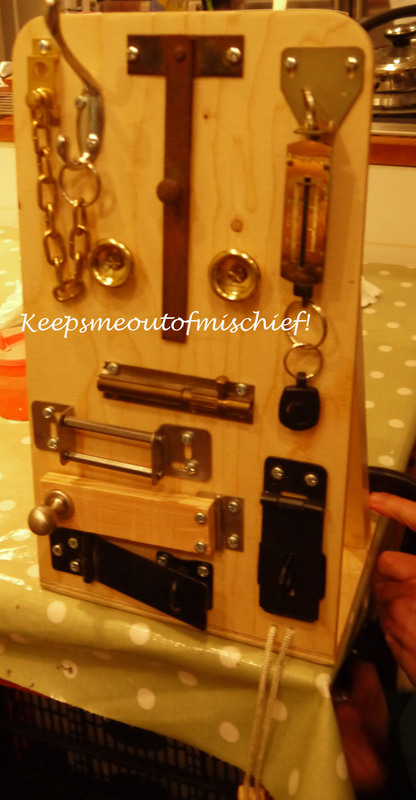 He ferreted around his garage to see what bits and bobs he had floating about and made this busy board – keeps little B entertained when I’m preparing meals! Grandpa’s next project is a bed for little B’s big boy bedroom for when he gets too big for his cot.